Man Up - #1 - It is Time to Man Up! During my generation a plethora of books have been written about the “Christian Man.” Bookshelves are loaded with "how tos" and relational gadgets to fix the problem of the 21st-century man. So much has been written concerning the emasculation of the American male. I do not wish to revisit those topics. Instead I believe the measure of a true man can be found only in Jesus Christ. His manhood is to be emulated by all men. Jesus knew how to treat women in the context of a culture in which women were considered to be nothing but chattel. This morbid ownership of a woman by a man continues to this day in most of the Middle Eastern countries. In just two or three generations America has dismantled the nuclear family. Women have been told that their true success can be found in their careers. Motherhood and serving as stay-at-home moms is considered to be anathema. The roles of a man and a woman are so clouded today that men are acting as women and women are acting as men as though there is no difference between the sexes. Preachers are made fun off when they choose to preach on Ephesians 5:21-33 where the roles are clearly defined. A man is to love his wife as Christ loved the church. A woman is to reverence her husband. The prototype of this relationship is to be found in Christ and His relationship to His Father and His Church. Jesus and His Father are equals yet with different roles. Paul made that clear in Ephesians 1 where he states that the Father elected a people before the foundation of the world, the Son, Jesus Christ effected their salvation by His death on the cross and the Holy Spirit continues to gather God's elect from the four corners of the earth. The roles of the three Persons of the Trinity are different yet they are equals. Their relational design is meant to accomplish but one purpose, the salvation of the Church. 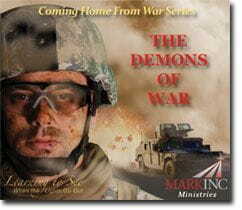 Demons of War The hidden wounds of war - those that wound the spirit - are addressed in this resource.